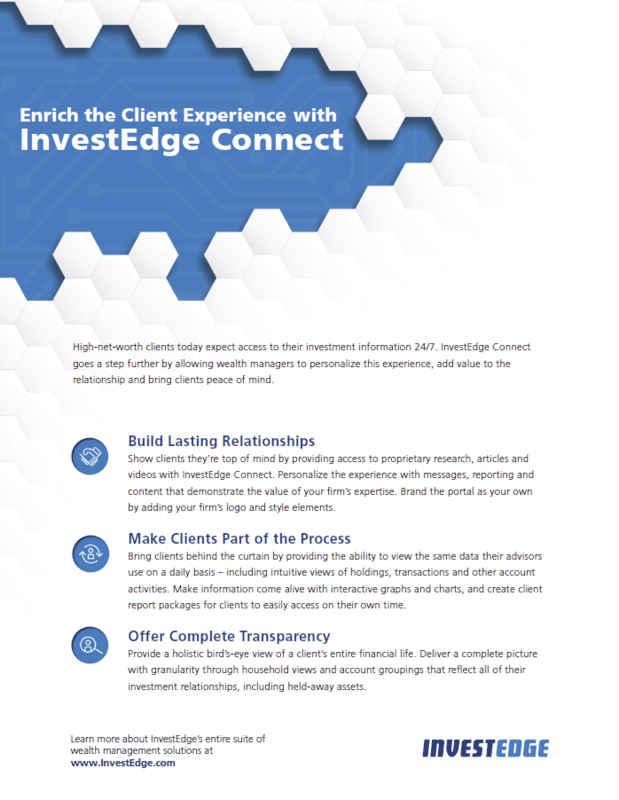 With InvestEdge Connect, your clients are able to access the same rich data and analytics you use as an advisor ensuring consistency in sharing account information. Promote your brand through customized application of your company logo and style guide to the portal, and drive the client experience with research, videos, and articles that promote your investment expertise. Allow your clients to see their total wealth through household views and account groupings that reflect all of their investment relationships. Give them the total investment picture by including held away assets through data aggregation. Help your clients understand their investments through interactive and intuitive views on Holdings, Transactions, Gain & Loss, and Performance. Enhance the advisor/client relationship by controlling content that the client sees on the InvestEdge Connect client portal. Provide access to report packages, statements, and other client related documents. Communicate securely through multi-factor authentication and drive portal adoption through email notifications that advise the client that content has been securely updated for them to see.